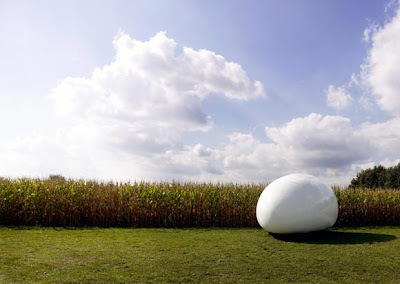 Blob by architects dmvA is a mobile shedlike atmosphere with a definite egg-like appearance. 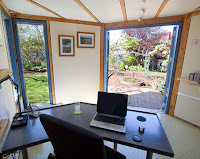 It was built as a moveable living unit but with an eye on being used too as a garden office or studio when the architects were having planning permission problems with a client. The structure is largely wood (click on the links below to see step-by-step images of it being built) and inside is a shedworking atmosphere which really is something extraordinary. Lots more photos of the construction at the dmvA site and also the Office for Word and Image site by Vercruysse Frederik. 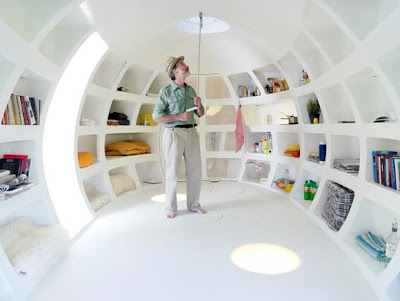 Good storage! Always a challenge in a small structure.